The new UTS Startups program will support student-launched, scalable startups by offering access to a range of resources, industry connections, mentors and other benefits. With the recently appointed UTS Director of Entrepreneurship Murray Hurps at the helm, UTS Startups will inspire and support students to become startup founders. Designed to function as both an aggregator and a connector, the program will facilitate the growth of a dynamic startup community and offer members the opportunity to make valuable industry connections. In addition to exponentially increasing the number of student-launched, scalable startups at UTS, the ambition is also for UTS to lead Australian universities in supporting student entrepreneurship and the creation of startups. Director of Entrepreneurship Murray Hurps, who brings two decades of experience in the Sydney startup world to his role at UTS, says the initiative aims to engage with as many students as possible. “UTS Startups are all about building a vibrant community to inspire and support student startups, with a focus on building a new generation of founders,” he said. “We want to encourage students to see the opportunity in startups and begin their journey when it’s right for them. Under Hurps’ leadership as CEO from 2014 to 2017, Fishburners supported 845 startups and grew into Australia’s largest startup community. Prior to that, Hurps co-founded and led Startup Muster, the largest survey of the Australian startup ecosystem. 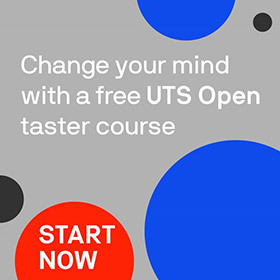 UTS Startups are open to all UTS students and/or teams where at least one founding member has been a UTS student in the last 12 months, and can be at any stage of the startup. Members of the UTS alumni community who are interested in getting involved by offering industry support and connections are encouraged to lodge their interest here. This information will be used for introductions generated during regular check-ins with startups at UTS, as well as invitations for activities such as mentoring and judging. In addition to financial resources, industry connections and inspiring mentors, members will have access to other support mechanisms such as free co-working space; participation in regular pitch nights; connection to industry events; profile building and regular coaching to track progress, identify needs, set goals and provide introductions to opportunities. “It is not about prescribing a path or formula, but instead creating an environment where student founders are exposed to what they need to progress – both inside and outside the university”. Conexie – audience and internal communication platform. Co-founded by Matthew Waugh (Bachelor of Sport and Exercise Science, 2013). Fortifex – a single management system for cryptocurrency investments. Co-founded by Luke Jones (MBA in Entrepreneurship, 2017). Resolution 123 – online legal support for employment issues. Co-founded by Carly Stebbing (Bachelor of Laws, 2008). Stitchhub – connecting those living with chronic illnesses with holistic support. Founded by Lucy Allen (Bachelor of Creative Intelligence & Innovation, 2017), Eliza Marks (Bachelor of Creative Intelligence & Innovation, 2017) and Polina Pashkov (Bachelor of Creative Intelligence & Innovation, 2017). Tekuma – one-handed control for robots, drones and other devices. Co-founded by Annette McClelland (Bachelor of Arts, 2013 and MBA in Entrepreneurship, 2018). The launch of UTS Startups also follows the announcement of the university’s milestone partnership with Fishburners, which includes student internships and desks in the Sydney Startup Hub. Visit startups.uts.edu.au to find out more and sign up to the UTS Startups newsletter. This article originally appeared in UTS Newsroom.